as in, "your house should be featured in a cutizine!" So...can you come and help me decorate my house? It feels like a boring little hovel compared to your awesome domicile. I pay helpers with food and alcohol and cuddle time with my pugs. Deal? I LOVE the peacock tree. I LOVE super heavily-decorated tress. 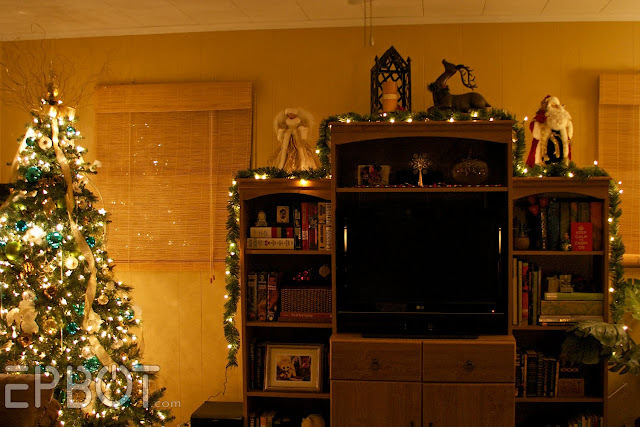 My husband loves sparsely decorated trees. This year, we let our 3 and 1 year olds decorate, so it is heavily decorated from about 2 feet down and sparesly decorated with our dear favorite ornaments on top. Though I'm starting to think we should do a theme.... Thanks for the inspiration! 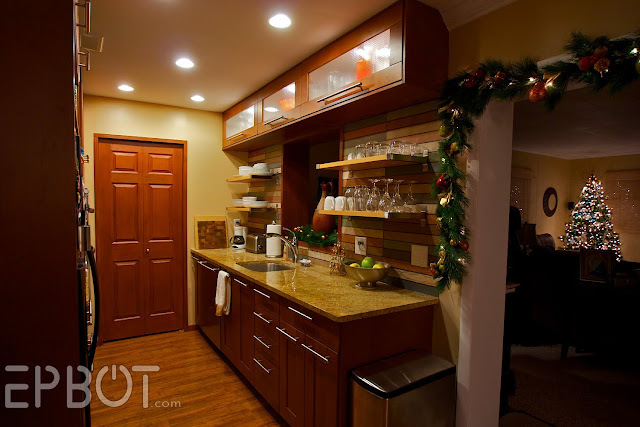 First of all: love, love, love your kitchen!!!! We are hoping to redo ours and I may have to show the husband that pic to motivate. Your peacock feather tree is amazing. I would never in a million years be that creative. And the bow just works. thanks for sharing your house!! My tree is a fake white 6.5 foot tree decorated solely in robot ornaments and candy canes. 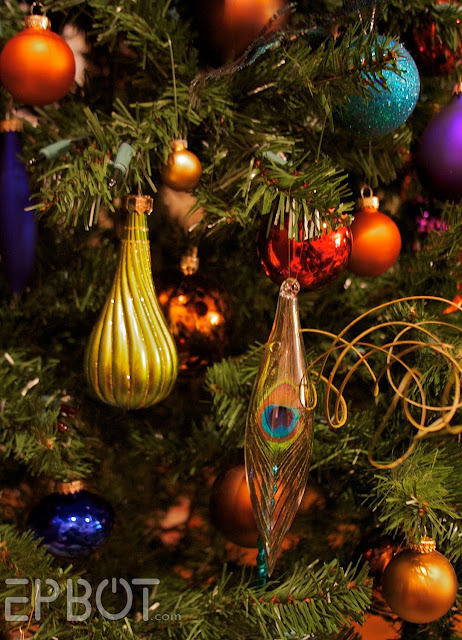 I actually really like the peacock feathers on the tree! 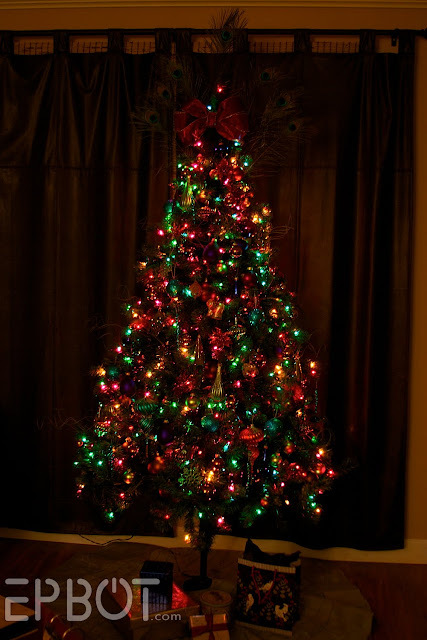 and the tree in the back room kinda looks like there is a swath of dark on purpose where the lights went out...so not too naughty. off topic- why does the disney world sign not have florida on it?? Oh I LOVE you for posting these pictures! It's looks amazing and gobsmackingly Christmassy!!! We did an entire Disney tree this year. I'm so excited to have an excuse to photograph it. Will post some pics on CW FB. We're such Disgeeks that we have several Disney treetoppers and have to cycle through them each year. Sparkly Tink with light up wings is my favorite! Ohhh! Ahhh! So beautiful! I love Christmas decor! Seriously, my husband would tell you that my most prized possesions are my Christmas decorations. We have a Santa/Candy Cane theme for our house. I'll see if I can get a good pic. Thanks for sharing! I LOVE your trees! Unfortunately, I'm not decorating my house this year. I'll just live vicariously through yours. That peacock tree topper is incredible! Good job. Thanks for sharing. @ Mary B. - Oooh, *spiced* butterbeer?!? WANT. Do you have a recipe to share? @jkel - I totally need a pic. I *love* robot ornaments, but sadly have none! Thanks for posting. Now I feel a like friend you invited into your home. All of the decorations are really great, but after looking at the photos, I just have to know what your back splash is. Thanks! I really LOVE your house Jen, like in a major "I want to live there!" kind of way. I also love you, but not in the same way because that would just be weird. The first thing I thought of when I saw your peacock tree was gee, they must not have cats. Then I read further that you do. How do your cats NOT attack the feathers, ribbon and garland??? Do you have special magical cats that actually behave??!!?!? I LOVE the WDW sign! Holy crap that's awesome! Oh, and the decorations are really lovely as well, of course! I created a tunnel for her myself when she started trying to dig her way through. Your tunneling cats made me think of it again so I offer it up for others amusement. Maybe when my kids are older and won't tear everything down ten minuets after it is up, you can come decorate my house. It looks amazing. I am also "one of those people" who wrap empty boxes for fun. My first Christmas with my husband that is all we had for decorations on the tree. @ Laura - our backsplash is actually faux painted tile - do you like it? :) We found this unbelievably expensive tile in some hoity-toity tile shop, took a picture, and then came home and recreated it on the wall in paint! I love the colors and shape. It was time-consuming, of course, but since we were faux finishers at the time, we already had all the supplies. I love all the little "hidden" decorations! My tree has a "celestial" theme in that 99% of the ornaments are either a sun, a moon, or a star. 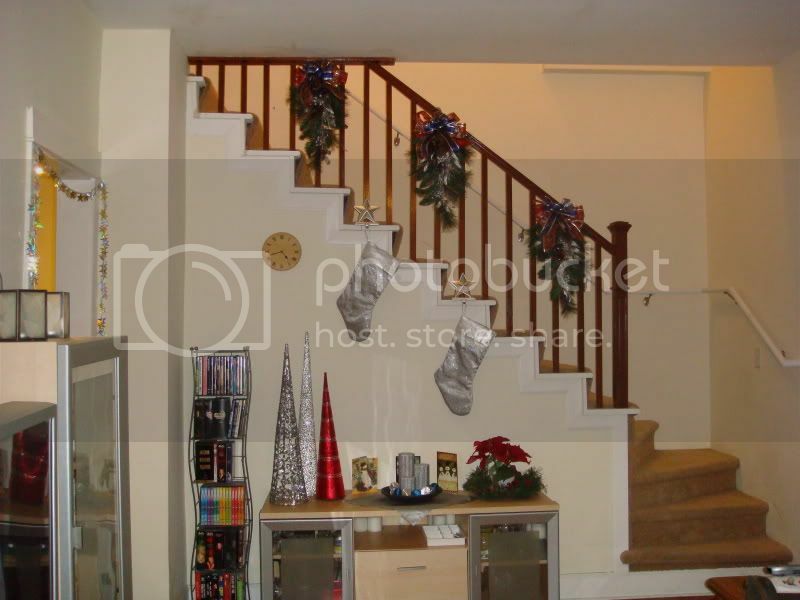 When we moved into this house I was SO excited that I finally had a banister to decorate. We may not have a fireplace, but at least I have my banister. 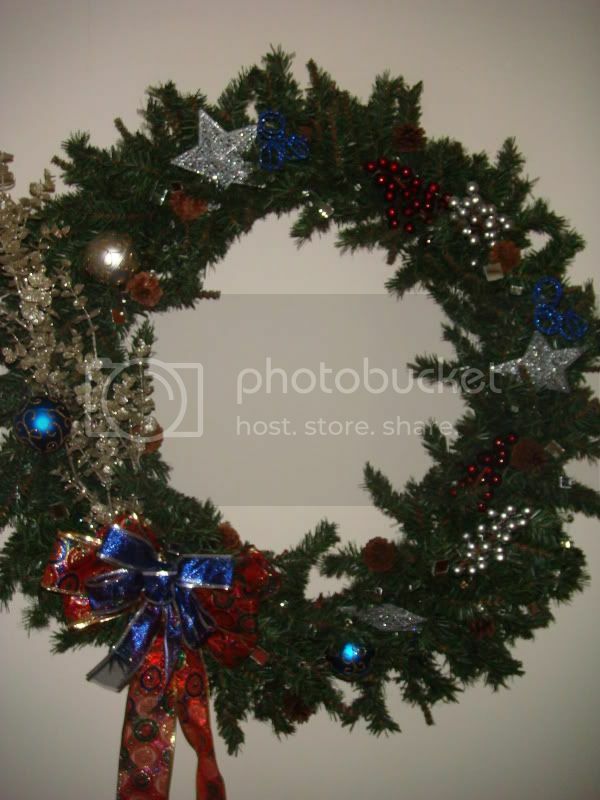 There's also the matching wreath that you see immediately upon walking in the front door. I decorated it myself with some design assistance from my mom. 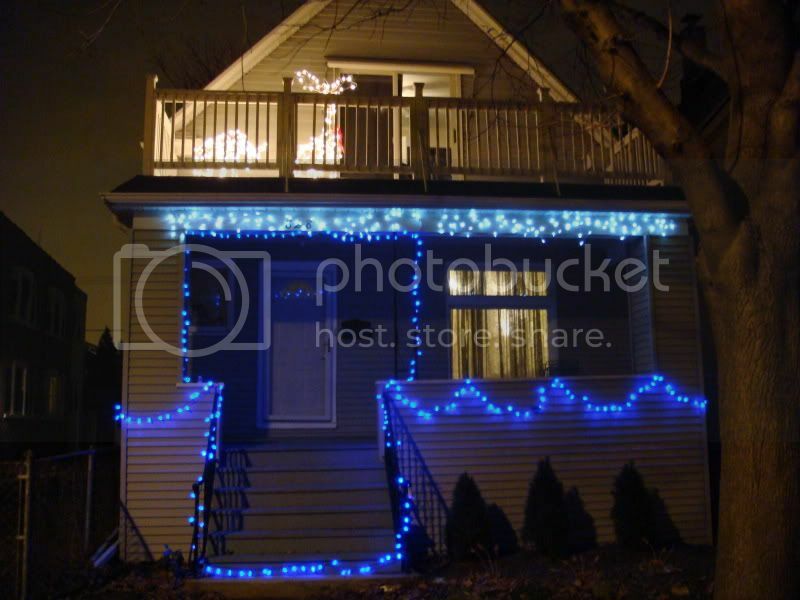 And we hung lights on the outside of the house. Still perfecting this but one of these years I'll get it to where I like it. Thanks for sharing! I don't get to deck my halls quite as much as usual this year, and combined with the absence of snow, I'm feeling decidedly un-festive most days. 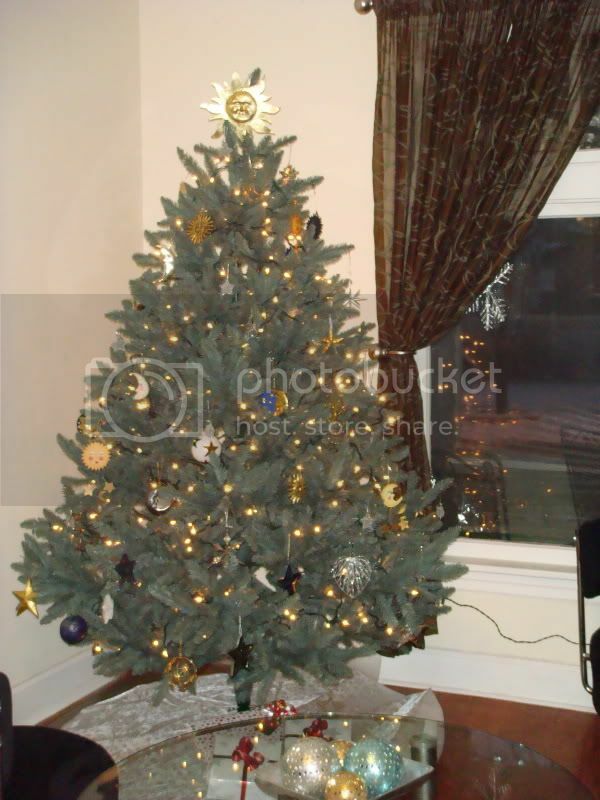 But your trees and decor are so lovely it helps boost my Christmas Spirit! Love the tree with all white lights sooooo much! I'm an all white light girl, myself. I love that you also load the lights on too! No skimping! Everything is gorgeous! Thanks for sharing!! 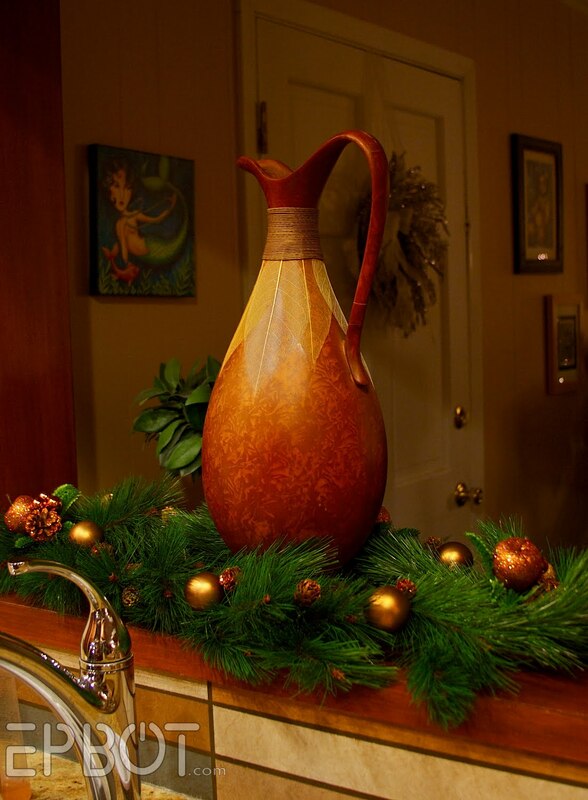 Your decorations look great, and I love, love, love your kitchen! I have to echo @LauraM and also ask about the backsplash... it's fabulous! Btw, any chance you'll divulge what town that gas pump is in? I'm guessing somewhere around the midcoast area based on the sailboat pic... am I close? ^_~ I love the peacock feathers! Your house is adorable. I really like your kitchen. Wish we could go that route, but we have kiddos. Which means big boxes of colorful cereal and lots of wild patterned kids dishes. Fantastic job! I love all of the little wrapped boxes jauntily placed everywhere. Thanks for inviting us into your awesome home! We have an "old fashioned" tree with random decorations. My husband gets one for me every Christmas that symbolizes something that happened the past year. Awww. Your house looks great! I would love to eventually have themed trees/rooms, but I need more space/time/decorations before I can get to that. I love Christmas decorations but didn't put them all up this year. The BF and I just moved in together, and I didn't want to overwhelm him with Christmas spirit right away because he is more of a Scrooge. As a licensed interior designer practicing in Orlando, I have to tell you that in my professional opinion, your house looks stunning. Really, very well done, absolutely gorgeous! Thank you for posting the pics! I could only dream of living in a house oozing with that much style! For now, at least while the hubs is finishing his PhD and we're still doing our part to contribute to the population (our tree is done in typical we-have-a-toddler fashion--with ALL of the ornaments on the top third of the branches). I've said it before and I'll say it again, Jen--you rock my world! Oh, Jen, it is GORGEOUS! I absolutely adore your house and your decorations. I have been so inspired! I have a super small special-needs house (I'm renting, so whatcha gonna do?) and now I'm brimming with ideas! Thank you for sharing your home with your underlings! 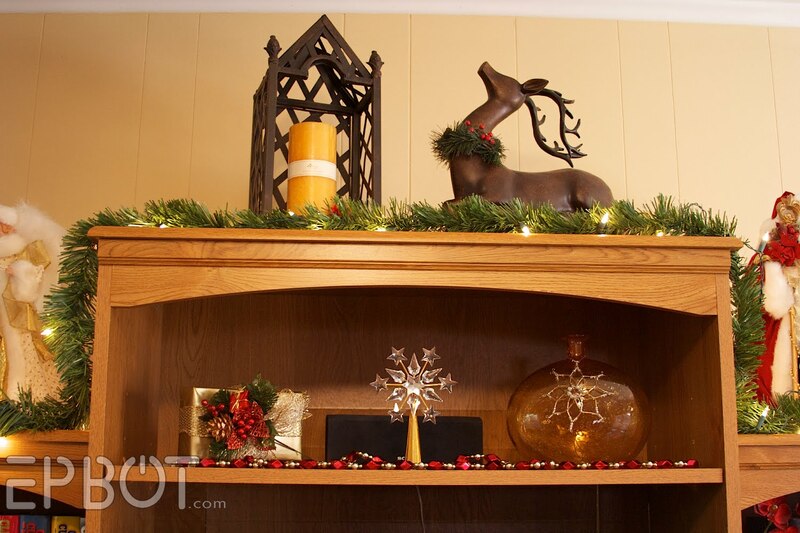 My favorite part of your decor is that you buy your ornaments at Big Lots like I do! :) I absolutely LERV your table top displays the most though. It's the small touches, right? Merry Christmas! and it's nice to know i am not the only person who wraps empty boxes, and saves them. Your decorations are SO beautiful!!! The trees are lovely. Especially the peacock feathers. :) I can't wait to see the tutorial on the steampunk goggles next year. Happy Christmas! It looks so Christmas in your house! Love it! We've only really got one room and I still haven't managed to do any Christmas at all yet. Although, I have two kids under 5... I choose to blame them for eating my time. But they're cute, so they can stay. Your cat is named TONKS??? That's just plain amazing. 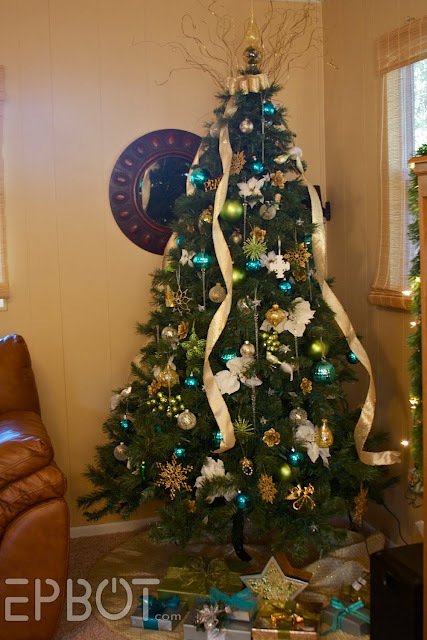 Is it common for people to do themed trees? If you do a different tree each year, do you get new ornaments?? What do you do with the old ones? Our theme would probably be... Ghosts of Christmas Past since we put up all of the old ornaments we've been receiving since we were children. There's Sesame Street, Dr. Seuss, dinosaurs, Ninja Turtles, and a random assortment of ornaments representing various hobbies we had as children. 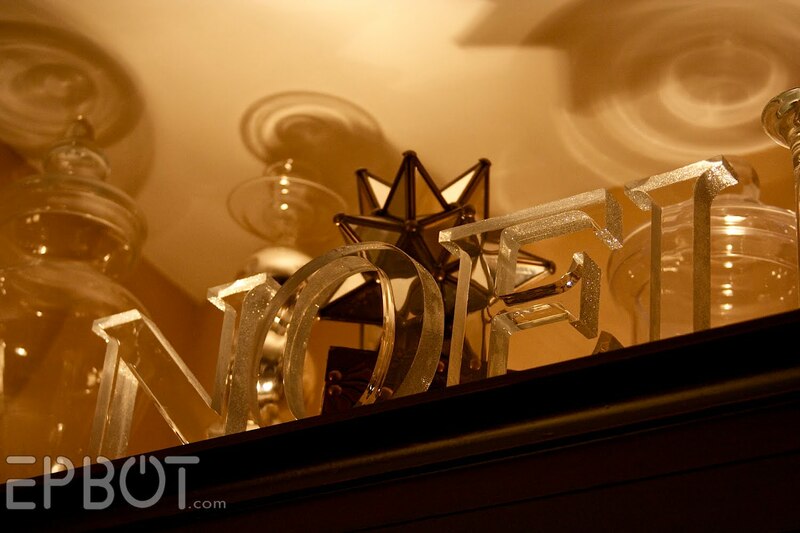 We have an annual Christmas banquet early in December, and the venue always has a different theme each year. Last year was feathers. close up of glittered peacock feather"
You have a great eye for detail :). 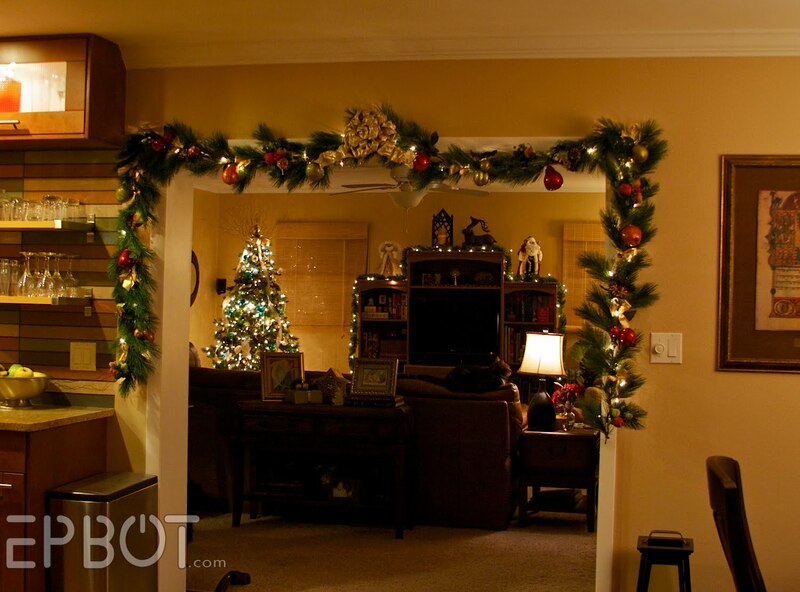 Your whole house looks so pretty... stores should hire you for holidays to make displays! So pretty! 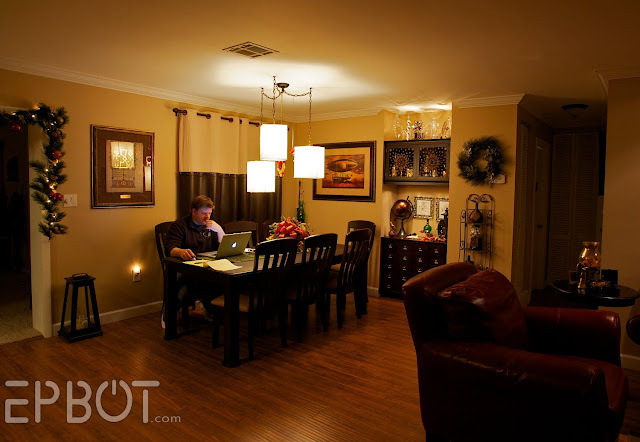 Your house is so "catalog" -- but in a good way, not in a who could possibly live there way. And we have the Enterprise ornament, too. It rocks! You have the most exquisite sense of esthetics I have ever seen. Gorgeous. 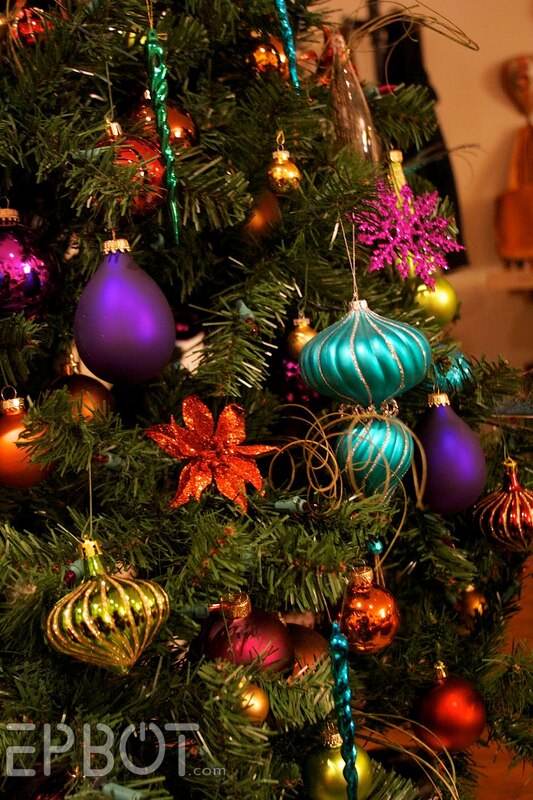 Wow~ Your trees and decorations are so beautiful! wish i could invite you over for a month to decorate my house! your place looks so wonderful! And before I even go to the part where you proclaimed your moment of falling in love with twinklie lights at WDW, I was thinking your trees look so much like Disney World trees. Sigh... I'd be ashamed to post my pitiful decorations. So pretty! Our tree still isn't decorated properly, because the kids keep arguing about ornament placement. My oldest son came to me a few days ago complaining that my middle son was violating the Neutral Zone on the tree by placing the Klingon Bird of Prey ornament too close to the Enterprise ornament. Sniff, sniff.... I was so proud. What everyone else said about the house! You obviously have the 'good taste decorator' gene. I sadly am lacking that gene. I need to hire you and have you come make decisions for me. I too adore the colors of India. Maybe because I love the fall and all its autumn colors. I immediately knew that those cabinets were from IKEA. I adore that store. and the style you have is MINE, you just got their first!. I currently have paint and pipes in my kitchen as i am getting a new one installed and i am going for the IKEA cabinets too. I thought about placing the cabinets on their side, too, but have an irrational fear of them closing on my hand as i reach in. Did you take any photos of the kitchen install? you kitchen is just slightly larger than mine and i would be curious to see yours. i hunt the ikea fan page a lot for ideas, but one can always use more. 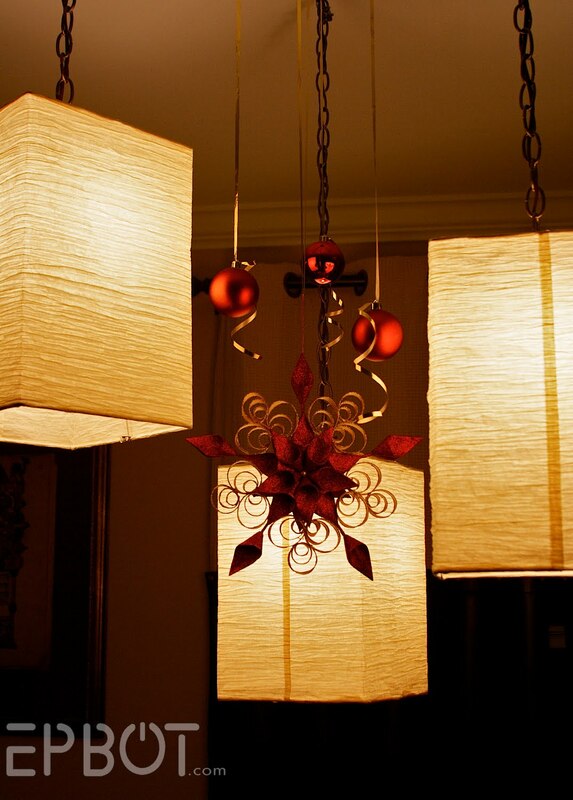 I love your Christmas decorations and house decor in general! And I totally know that Star Trek ornament... my husband has one on his Star Trek/Star Wars tree! I JUST bought those peacock feather ornaments from Crate and Barrel about a week ago. I love them! 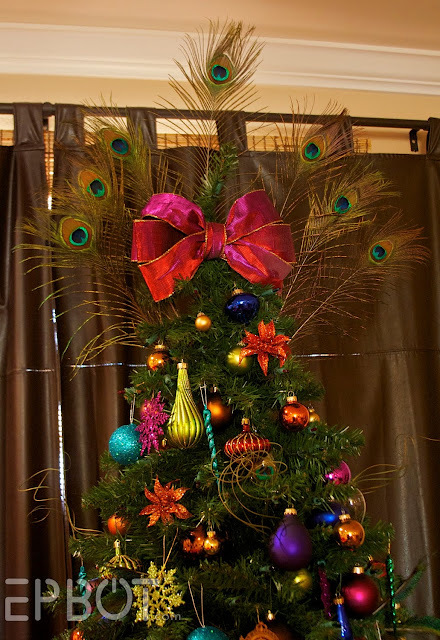 I will be attempting a peacock feather tree topper next year. I just started reading your blog and let me tell you, I LOVE IT. Its fantastic. I adore your tree. I love rich jewel tones for Christmas time. Also am a huge fan of the steam punk table decorations. Im always looking forward to your next post! You have wonderful taste! Your decor is eye catching and fun while remaining completely classy... inspiring! Thanks for sharing. I love the peacock feathers with the big bow! It just made me smile. Thanks for sharing your Christmas decorations with us. Heheheh Love the noel sign, we had a large light up one that went outside, I really hesitated to tell mr punxxi that he had put it up wrong and it said leon, cos I kinda liked that better. 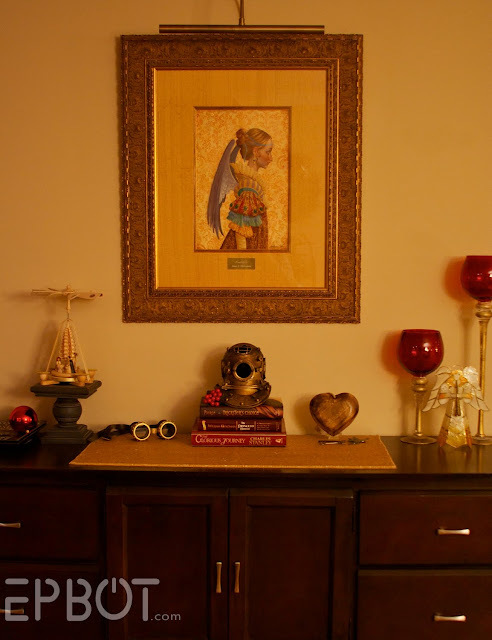 I noticed the James Christensen print immediately. Love it! I have "Two Angels Discussing Boticelli". What an amazing artist. I love love love the peacock tree. Thanks for sharing. Thanks for sharing your house! It is STUNNING!! We could so be friends- I am loving the Disney sign! I blogged about how you and I could be pals munching on cake thru WDW. =) Jealous that you live so close to our favorite place- we have to wait until Sept! 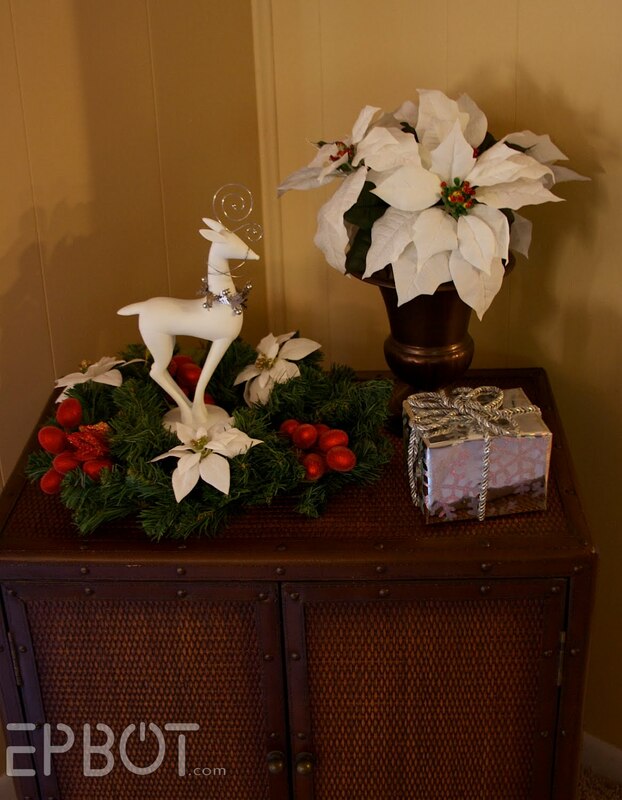 It would take me longer than three days to clean up the house in order to take pictures of my Christmas decorations. And your lovely clean house. Your stuff all looks great! I love all your reindeer. Reindeer are probably my favorite part of the holiday season. Wow Jen, so immersive! Thanks for sharing. 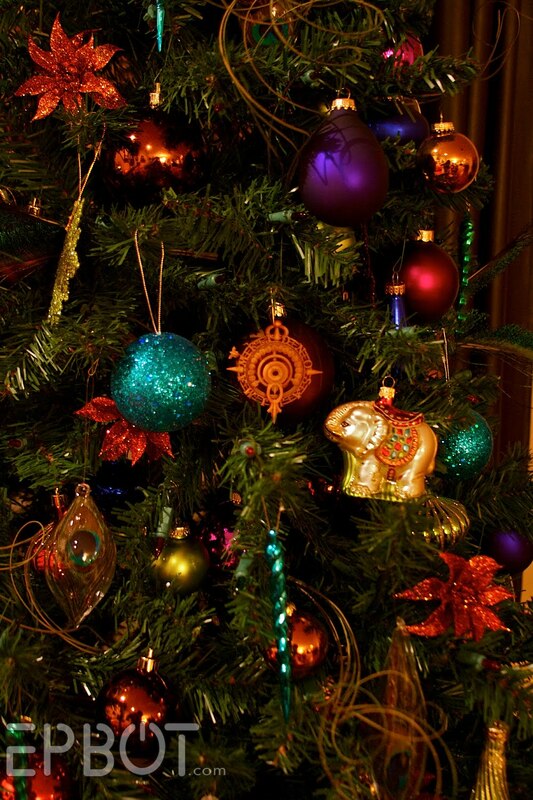 I'm especially fond of the peacock tree (I love jewel tones). All I could think of is how having peacock feathers in the house is bad luck. Well, here in England it is anyway. I like your other tree though! oh wow *dreamy eyes* I LOVE your decorations! The trees are gorgeous! I can't decide which one I like better (I'm leaning toward the epic peacock feathers one). I wish I had the money to decorate my house like that! My decorations are pretty shabby this year because we have a 7 month old puppy in the house... I had to invest in some shatter-proof ornaments to avoid destruction of my well-loved glass ornaments. I will definitely be using your house for inspiration for years to come though! 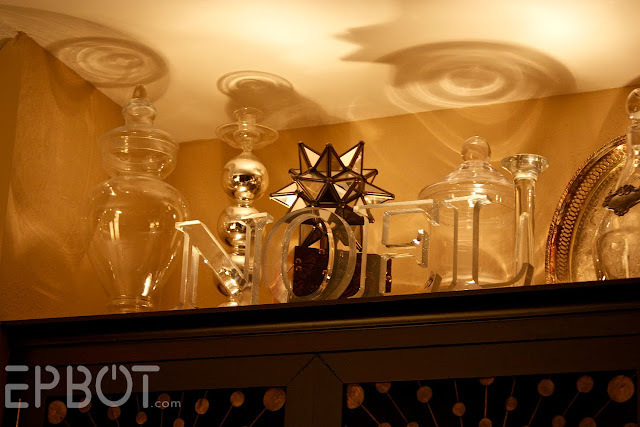 "Having them in my house now is a little slice of twinkly heaven - or maybe Lothlorien." You're home looks so beautiful! 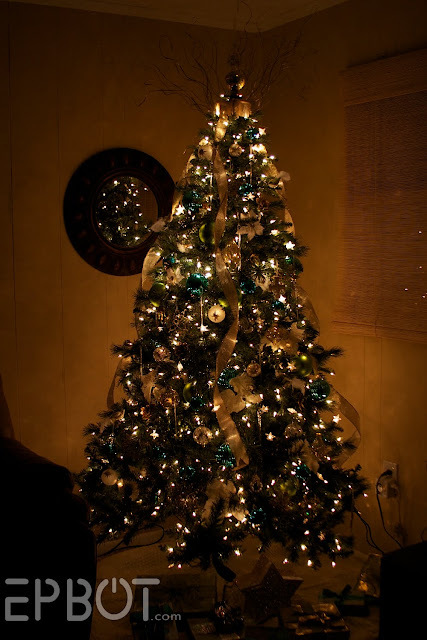 And I love the trees since both have an abundance of teal ornaments - my fav color! Squees all around!!! That is not just a steampunk compass, that's a legitimate geologist's Brunton Compass. Those things are awesome, and for a new, good one you could be paying over $200. I'm jealous that you have that. Oh, and your christmas decorations look great too. ha. Every year I take down all the pictures on my walls, wrap them in pretty holiday paper, and hang them back up. 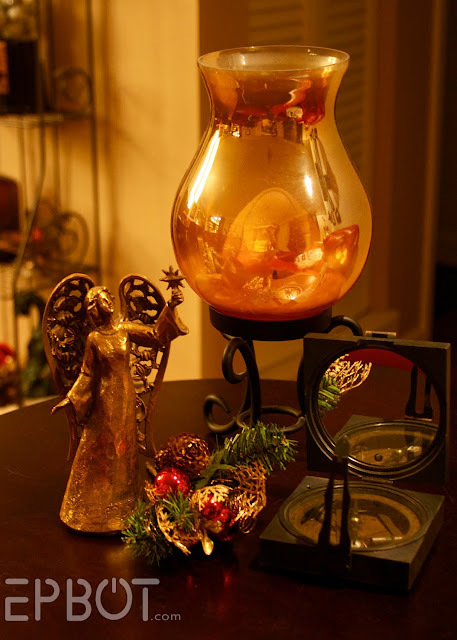 It ends up looking really cool, and blends well with all my other holiday decorations. I love it! Your decorations are fantastic! I love how well they match what's already in your house. It gives a very put together feel. Also, aside from the fact that I'm in love with your entire house (that I've seen) I might have to steal (or buy, whatever) your red living room set. I still maintain I need you guys to decorate for me. I'm sitting here looking out the window at our first snowfall of the season, and your decorations are the absolutely perfect cap to a pretty day! You are SO talented -- seriously, you have a real gift for decoration. 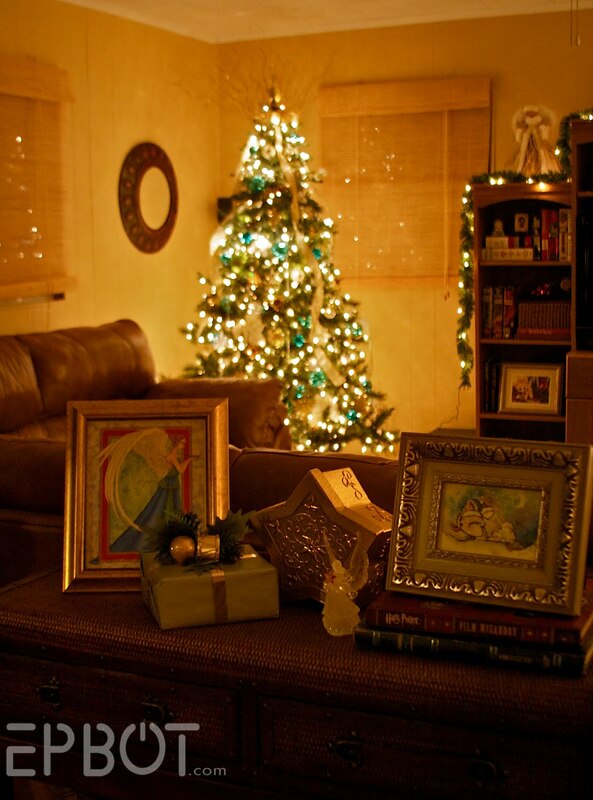 As someone without a decorating gene, may I say how much I admire and adore what you do? I have that exact same Star Trek ornament!!! My parents bought my sisters and I a new ornament each year for Christmas, and pretty sure my dad picked this one out more for him than me. Joke's on him, 'cause I get to keep it! 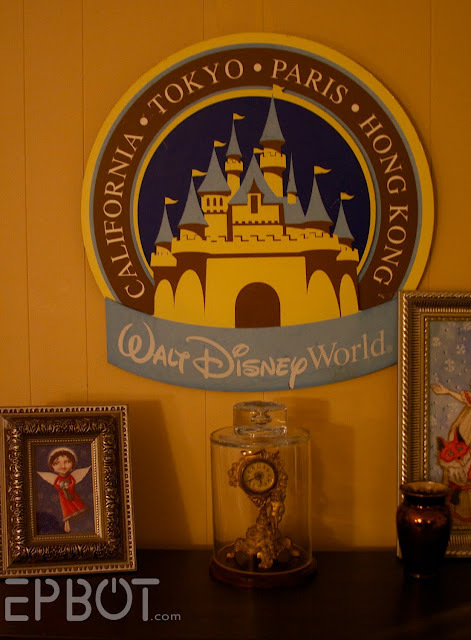 Oh my gosh I LOVE that vintage Disney sign!!! Where on earth did you find it?? The "pass through window" is called the "puka." I'm not sure how you spell it, but it's pronounced like Pookah. That's the official word for random decorative holes in walls. Awesome, awesome decor! I love it! I'm a big fan of peacock feathers. As usual, we stayed with a geek theme - Star Trek and Star Wars ornaments - with some sentimental, traditional ornaments thrown in. First, your blog is fantastic. I love it. It makes me happy. Second, you have the exact same Enterprise shuttle ornament that my father has, and that makes me REALLY happy. So not related, but I was watching Castle on ABC and they had an episode involving Steampunk! I thought of you when I saw it. Where does one find twinkle lights? The hippie in me wanted to switch to LEDs this year, but MAN, they are so ghastly and harsh. Love the swizzles and such coming out the top of your trees. They're like Christmas jazz hands. Ta-da! Shuttlecraft to Enterprise, shuttlecraft to Enterprise. Spock here. Happy Holidays. Live long, and prosper. In other words, my father was a Trekkie, and I grew up with that ornament on our tree (along with most of the others of that series). And every year, once the tree was decorated, the first thing I did was find that ornament, flash the Vulcan hand sign, press the button, and lip synch the words. Ahh, memories. 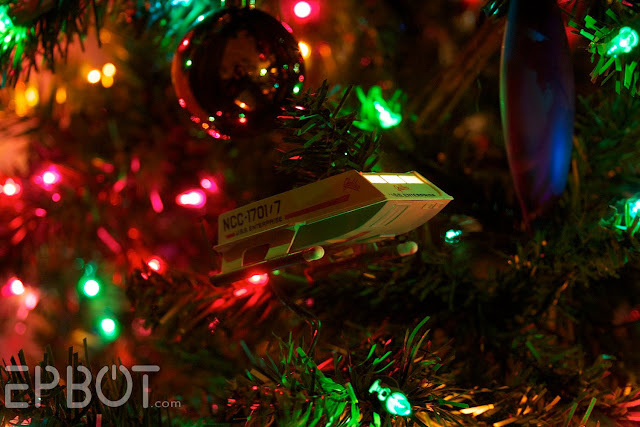 I have that same shuttlecraft ornament. It is one of my cherished Christmas ornaments. I was able to plug it in and hear Spock's voice this year for the first time in a long, long time. I used to play it for my answering machine message every December. Love your trees, Jen! Where can I get a male model like that, huh?? I'm moving into your house. That isn't a question. Second, John has moved up a space on my awesome list because he's from Maine, my fave place ever. 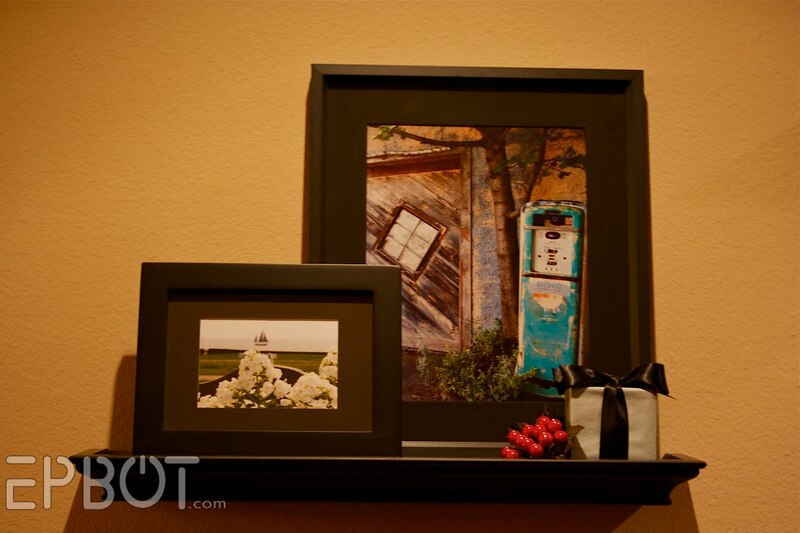 I just wanted to add my own Ooh and Aahs over your beautiful home / decorating. Also I have EVERY ONE of the Star Trek series of ornaments my parents have been getting them for me since the first Enterprise came out around 1990? About 2 years ago we had them all on our tree and the tree on a timer, and my sister in law happened to be at the house when it went on. Spock, Worf and assorted other voices scared the snot out of her. We still laugh about it every time we set one off. I would also love to know where you get twinkle lights! Come on Jen, you need to spill for your fellow geeks. I LOVE LOVE LOVE your house. We have too many bare walls and sparsely decorated spaces. And two Christmas trees? Fabulous. Though, I'm sure mine is bigger. It touches the 13.5' peaked ceiling in our main room. Also, it took two weeks to decorate and I'm not a fan of heights. 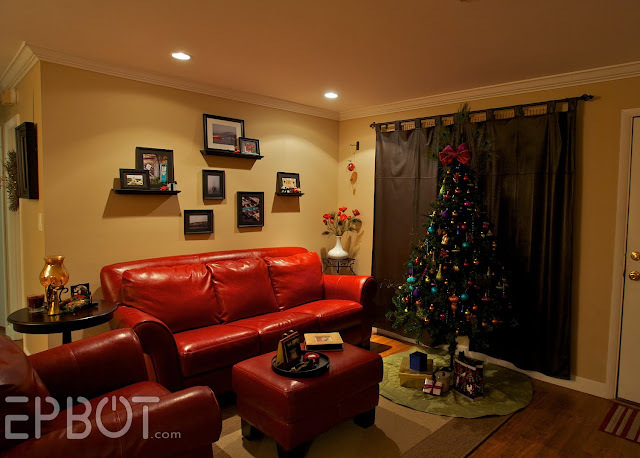 Your house looks awesome and so festive. Can you come decorate my house too? :) Our tree is up, but I love your other decorative touches, and I love idea of the wrapped empty boxes. I might have to try that next year (I have pretty much given up on anymore decorating this year). I don't really go all out for holiday decorations, but I was quite pleased with my table centerpiece (last pic of the post). As I mentioned, the cake dome was mostly to cat-proof the ornaments, but I think it looks cute too! I like your little table top arrangements. I do that also. AND I wrap boxes for fun. My favorite part of gift giving is the wrapping. 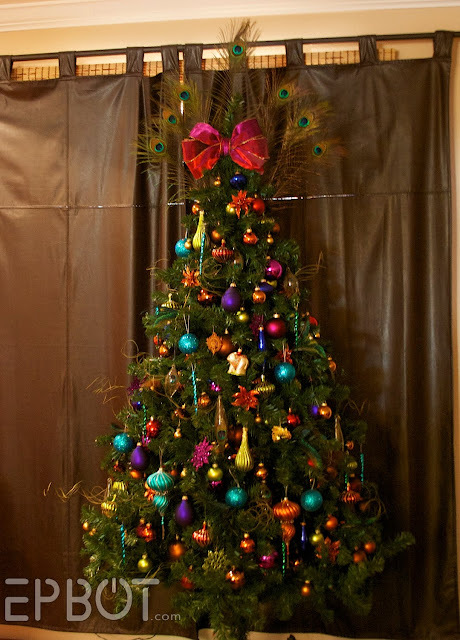 Wow, I love your peacock tree! The peacock feather is one of my belly dance teacher's fave studio decorations. So wish I had a Big Lots up her in the north, I don't what kind of store it is, but I would definately buy one of those peacock glass ornaments! I don't have pictures of my decorations, which are mighty tame in comparison, but I do have pictures of some of the steampunk touches I noticed in Holiday Windows this year! I love to live vicariously through you, Jen. 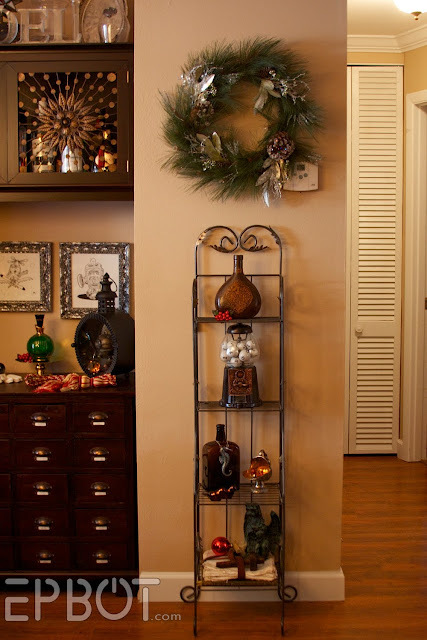 That way I can enjoy your decorations online, but don't have to put all the things away for next year! I should send you a photo of our creche scene, though. All kinds of visitors come to the manger . . . I'll try to remember to do that later this week. Thanks for the tour! Dear Jen--your home is absolutely lovely. So is your heart. Thank you for sharing and inspiring. The house looks wonderful (both decoration and decor)! Thank you for sharing! It makes me feel all dreamy about the prospect of owning my own home someday! 2300 lights in 29 strands of lights. But it's beautiful and worth it. In the photo of the Magic Kingdom sign (fellow Dizgeek), I can see a smidge of a print with a fox in it. We have a huge fox collection, as that is our last name, and I love finding unusual foxes (this year I got an ornament off Etsy that looks like a snowflake, but upon closer inspection has foxes running around it)-any way I can see a pic of the whole thing, and maybe know where it came from? And now for something completely different. O, Christmas Tree, O, Christmas Tree... umm Christmas Tree??? Hi, Jen! I've been reading your blogs for years - love them. I used to be a professional Christmas decorator (I worked in a year-round Christmas store for 11 years), and your decorations are top notch! If you liked the Shuttle Galileo, you'll like my Star Wars/Star Trek tree. And for something REALLY different, I think you might enjoy my village. It's...erm...not your ordinary village (it has vampires). Cheers, and thanks for all the enjoyment you provide! I adore Christmas but am on a working holiday in Canada and am away from all my pretties. :-( It makes me cry. Especially since I can't get away from where I am to go buy more pretties. So I bought one teeny tiny tree and pretend it's awesome. Love you're stuff though. I have massive geek love for you Jen. I adore than there is someone else in the world like me and it makes me that bit more proud to be me. Holy wow! You have amazing design skills, your home is just beautiful. I have to say, my fav thing is the cabinet with the diver's helmet and goggles. I think that is so fun to have a touch of geek in such a classy way! So late, but OMG "shuttlecraft to Enterprise, shuttlecraft to Enterprise. Spock here, Happy Holidays. Live long, and prosper." I don't ever comment on your blog (I read it all ... I just don't comment) but I couldn't resist this time. Your house is absolutely STUNNING, and I am the most crabby, jealous person *IN THE WORLD* right now for seeing that. A little late here, but I just wanted to say how impressed I am with how clean and uncluttered your home is. I love it! disgustingly jealous of the disney sign. how on earth did you find that?! The "pass through window" is called the "puka." ... That's the official word for random decorative holes in walls. Jen, your house looks gorgeous, all of it. Your place is gorgeous and that print is breathtaking.